The Arroyo Seco River, a tributary of the Los Angeles River, drains the southern and western side of the San Gabriel Mountains. The gage sits at 1,475 feet, and is located upstream of the Pasadena urban area. The Arroyo Seco watershed is relatively small -- 46 square miles -- of which about 30 square miles are above the gage. The headwaters are at around 5,000 feet, on the western side of Mt. Wilson. The gage records were obtained from the California Department of Water Resources (CADWR) for the years 1911-2015. The reconstruction of water year streamflow for the Arroyo Seco River was generated as part of a project supported by the CADWR. This project includes reconstructions of water year precipitation (San Gabriel Dam, Lake Arrowhead, Ojai, and Cuyamaca) and streamflow (Arroyo Seco and Santa Ana River) for southern California and the Kern River in the southern Sierras. This set of reconstructions was developed by Dave Meko, Erica Bigio, and Connie Woodhouse in 2017, based on updated and new collections of tree-ring data in California sampled for this project. 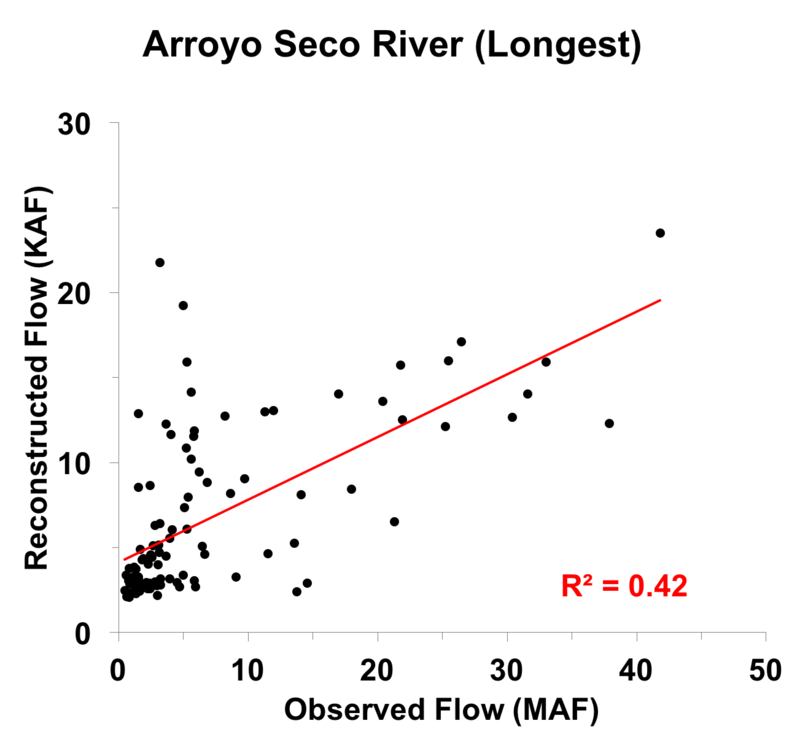 Average discharge of the Arroyo Seco River for the water year (October-September) was reconstructed using a two-stage regression procedure. Tree-growth at each site was first converted into an estimate of discharge by stepwise regression of discharge using tree-ring width indices, from the current year and lagged one year, as predictors. Squared terms on the tree-ring predictors were also included in the regression to allow for possible curvature in relationships between tree-growth and discharge. In the second step, the gage reconstruction was generated by averaging an appropriate set of single site reconstructions. Final estimates of discharge were interpolated from a piecewise-linear smoothed scatter plot of the observed discharge values and the discharge estimates averaged over the individual tree-ring sites. The procedure was repeated for subsets of tree-ring chronologies with different periods of common time coverage to build a “most-skillful” reconstruction, starting in the early 1400s, and a “longest” reconstruction, starting in the early 1100s. Details of the reconstruction method can be found here. Note: the statistics listed in the table represent average accuracy, while the reconstruction method yields error bars that vary in width over time -- generally wider for wet years than for dry years. The listed statistic R2, the decimal proportion of variance explained by the reconstruction in the calibration period, is computed directly from the reconstruction residuals. For an explanation of these statistics, see this document. Figure 1. 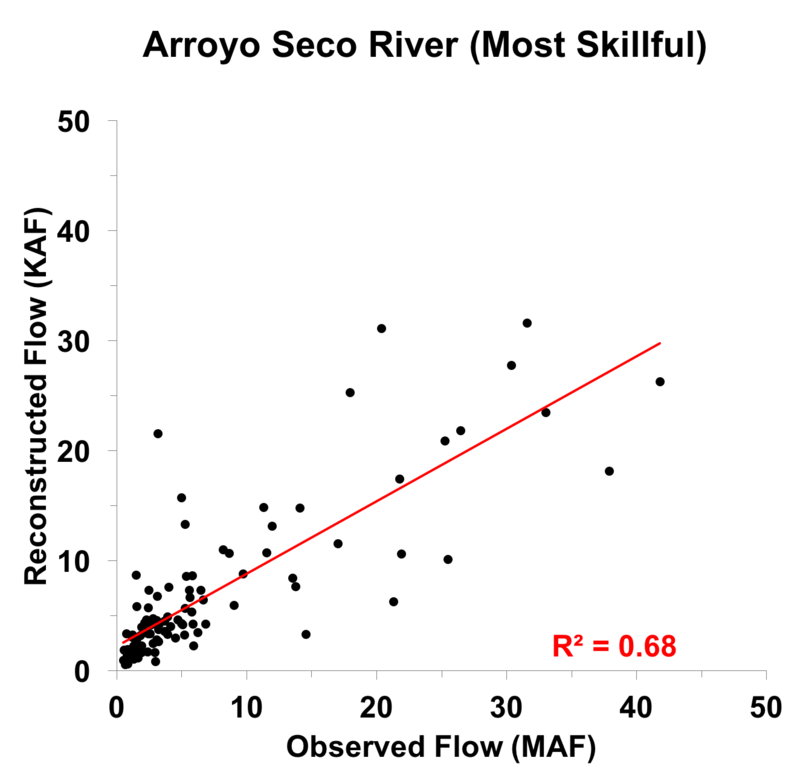 Scatter plot of observed and reconstructed Arroyo Seco River annual streamflow, 1911-2015. Note that the R2 value here is slightly different than in the table. The table R2 value is the average explained variance from the three models that make up the most skillful reconstruction. The value in the scatter plot reflects the explained variance for the two models that cover the instrumental period (more details). Figure 2. Observed (gray) 1911-2015 and reconstructed (blue) 1900-2016, Arroyo Seco River annual streamflow. The observed mean is illustrated by the black dashed line. Figure 3. Reconstructed annual flow for the Arroyo Seco River (1404-2016) is shown in blue. Observed flow is shown in gray and the long-term reconstructed mean is shown by the black dashed line. Figure 4. The 10-year running mean (plotted on final year) of reconstructed Arroyo Seco River annual streamflow, 1404-2016. Reconstructed values are shown in blue and observed values are shown in gray. The long-term reconstructed mean is shown by the black dashed line. Figure 6. Observed (gray) 1911-2015, and reconstructed (blue) 1900-2016, Arroyo Seco River annual streamflow. The observed mean is illustrated by the black dashed line. Figure 7. Reconstructed annual flow for the Arroyo Seco River (1125-2015) is shown in blue. Observed flow is shown in gray and the long-term reconstructed mean is shown by black dashed line. Figure 8. The 10-year running mean (plotted on final year) of reconstructed Arroyo Seco River annual streamflow, 1125-2015. Reconstructed values are shown in blue and observed values are shown in gray. The long-term reconstructed mean is shown by the black dashed line.